Can tropical stony corals adapt to bleaching? But what is coral bleaching actually? No, it is not mum that has stinted bleach over the lovely colourful tropical corals….although it looks like it. The explanation is quite different. Normally, tropical shallow-water stony corals only exist to dept’s where sunlight is able to reach. This is because they contain in their tissue a specialized kind of brown algae called zooxanthellae. These algae are crucial for the survival of the coral. The coral is supplied with nutrients from these zooxanthellae. They produce energy and nutrients through photosynthesis. However, this relationship can only exist at temperatures above 18°C. and below 31°C. When very hot summers occurs, and they do with a fast increasing frequency, the zooxanthellae instead produces something called “super oxygen”, that is oxygen with extra energetic levels donated by electrons. This is poisonous for the coral. Therefore the coral rejects the cell with the zooxanthellae. Thereby the coral looses the green and brown colour nuances from the zooxanthellae, and looks “bleached”. Coral bleaching is a phenomenon that can be caused by a lot of different factors that stresses the coral. It can be caused by different kinds of pollutants or by an elevation of the average temperature in the specific habitats or microhabitats. But in all cases it is caused by changes in the surrounding milieu that stresses biological ecosystems as the subtropical and tropical coral reefs. Especially phenomenons that include temperature elevations as the greenhouse effect and El Nino have been discussed in details through the last years. Such phenomenons have involved a general decrease in the coral reefs of subtropical and tropical regions. Calculations have shown that if such conditions are maintained, all coral reefs will become extinct in the year 2050. Some researchers, such as the two world famous scientists, Daphne Gail Fautin and Robert W. Buddemeier introduced in the nineties a hypothesis called “adaptive coral bleaching.” This hypothesis builds on the assumption that an adaptation by the coral to the new conditions (the elevation of the temperature) has taken place through symbiotic adaptation with zooxanthellae that are able to resist the increase in temperature, by which the host coral avoid to be poisoned by super oxygen. The adaptive bleaching hypothesis (ABH) is based on lots of observations in the field. Professor Daphne Gail Fautin and Professor Robert W. Buddemeier have worked out a generalized conclusion on their qualitative description of the ABH, in light of the existing field observations and data. The conclusion of this qualitative description of adaptive bleaching is that the coral-zooxanthellae symbiosis is able to make a dynamic response to the environment. There are possible mechanisms that might provide resistance and protection to increased temperature and light. These include inducible heat shock proteins that act in refolding denatured cellular and structural proteins, production of oxidative enzymes that inactivate harmful oxygen radicals, fluorescent coral pigments that both reflect and dissipate light energy, and phenotypic adaptations of zooxanthellae and adaptive shifts in their populations at higher temperatures. Such mechanisms, when considered in conjunction with experimental and observational evidence for coral recovery in areas that have undergone coral bleaching, suggest an as yet undefined capacity in corals and zooxanthellae to adapt to conditions that have induced coral bleaching. Stephen L. Coles and Barbara Brown continues: “Clearly, there are limits to acclimatory processes that can counter coral bleaching resulting from elevated sea temperatures, but scientific models will not accurately predict the fate of reef corals until we have a better understanding of coral–algal acclimatization/adaptation potential. If global temperatures rise as predicted by the current climate models, water temperatures in 100 years will be much greater than those that cause bleaching now. Consequently corals would need to acclimatise continually to survive. However, most research indicates that acclimatisation is limited and unlikely to allow corals to adapt in due time. to the predicted rise in water temperatures. A second process by which coral populations could adapt to new conditions is by natural selection. This results in a gradual change in the temperature-tolerance of the population through the elimination of the corals that cannot tolerate higher temperatures. As described elsewhere in this issue (see page 6, “Corals may survive global warming by gorging themselves”) some species will be better at adapting to changes than others. Also, different colonies of the same coral species may respond to thermal stress differently. If only the most temperature-tolerant corals survive a bleaching episode, the offspring from those corals might be on average more temperature-tolerant than the previous generation. Again, there will be limited how high the temperature can rise before corals reach the limits of of survival, and thereby their possibilities of adaptation. This would invariably also lead to extinction of species. Such adaptations are thought to occur slowly, over several generations (with most corals having generation times of at least 5-10 years), but potential rates of adaptation have never been estimated. Corals can host several types of zooxanthellae in their tissues. Another possible adaption to warmer conditions could be changing the dominant type of zooxanthellae within their tissues. Corals with a certain type of zooxanthellae can tolerate up to 1.5°C higher temperatures than corals of the same species without that type. It is not known how many of the almost 800 species of reef building corals can change the type of dominant zooxanthellae or, indeed, what stimulates the change. 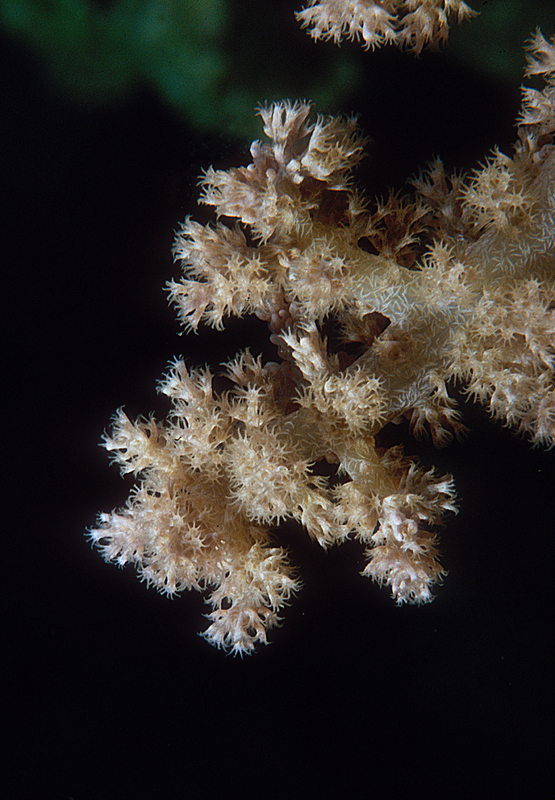 However, results from the laboratory shows that some corals can adapt to the heat resistant types of zooxanthellae under artificial circumstances. Increased temperature tolerance may also come at a cost. For example it has been observed that juvenile corals with heat-tolerant zooxanthellae grow up to three times slower than those with a different zooxanthellae type. The type of zooxanthellae that occurs in the corals may also affect other aspects of coral health. A third process is one in which larvae from warm-adapted coral populations may disperse to cooler areas as they warm, thereby changing the distribution of species creating new reefs further from the equator However, this is also likely to be a very slow process and as there are other ecosystems already in place elsewhere the whole picture becomes quite complex and unpredictable. But because the cooler areas warm, these warm adapted species gain an extra advantage in advance. But only the future will show if such settlements will succeed. There has been short-term recovery of coral reefs after bleaching events. When a reef is only slightly stressed, a few scattered corals will die, and the effect will be barely noticeable. When a reef has been exposed to prolonged heating, most corals will die, and it can take many years for the area to recover, in particular if large, old corals have been killed.